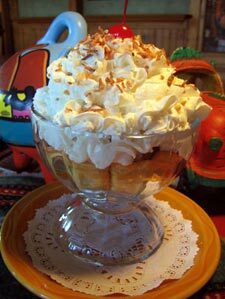 A scoop of Vanilla Ice Cream encrusted with Sam’s secret coated “stuff”, then deep-fried and served in a crispy Cinnamon Tortilla Bowl, topped with Hot Fudge, Whipped Cream and toasted Coconut. A traditional Mexican Egg Custard made with Coconut Cream, Dark Rum, Vanilla and ground spices; topped with a Golden Caramel sauce and toasted Coconut. “Cookies ‘n Cream” Ice Cream covered with a crunchy Chocolate crust, smothered with Whipped Cream, drizzled with Chocolate syrup and topped with crumbled Oreo Cookies. A “basket-full” of fried, crunchy Chimichangas stuffed with a Raspberry Cheesecake filling; dusted with Powdered Sugar and served with warm Chocolate Fudge ‘fer dippin. 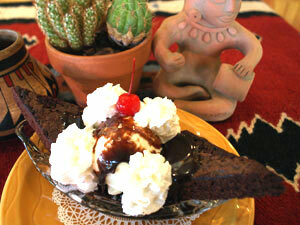 A “sticky ‘n gooey” Fudge Brownie served with Vanilla Ice Cream, Hot Fudge sauce and Whipped Cream. A pair of Raspberry Cheesecake Chimichangas topped with a swirl of Chocolate Fudge and a scoop of Vanilla Ice Cream topped with Whipped Cream ‘n Raspberry sauce.